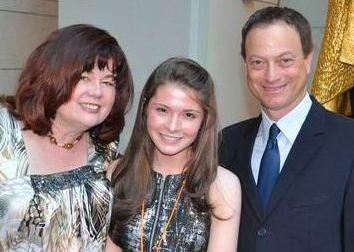 At left Jefferson Award-winner Cheryl Rhoads and her Cappie Award-winning student Virginia Tucker pose with Golden Globe-winning actor Gary Sinise at the 5th Annual GI Film Festival on May 11, 2011 in the U.S. Capitol Visitor Center. Cheryl serves on the Entertainment Advisory Committe for the festival and Gary has been honored by the festival with the GI Spirit Award. Virginia Tucker has been a volunteer staff assistant at the festival for two years.